A stellar ensemble, stirring score and vigorous choreography make Follies the quintessential high end musical. Dominic Cooke’s Follies sets the Olivier stage ablaze in a dichotomous cavalcade of vaudeville ennui. The year is 1971 and former starlets gather for a reunion in the dilapidated Broadway theatre where they once shone. After 30 years there’s a lot to catch up on for these former leads in Dimitri Wesimann’s Follies. Not least for one time best friends, Sally and Phyllis and their prospective husband’s Buddy and Ben. With Sally a homemaker for her salesman spouse and Phyllis living the high life with politician Ben, the couples reminisce over the exploits of their youth. But some things are best left in the past. In the enchanted world of Broadway, echoes of the past ring out and the foursome are haunted by their former selves. As drinks flow and revelations aired, our quartet gaze ever more longingly towards the past and the people they thought they would become. 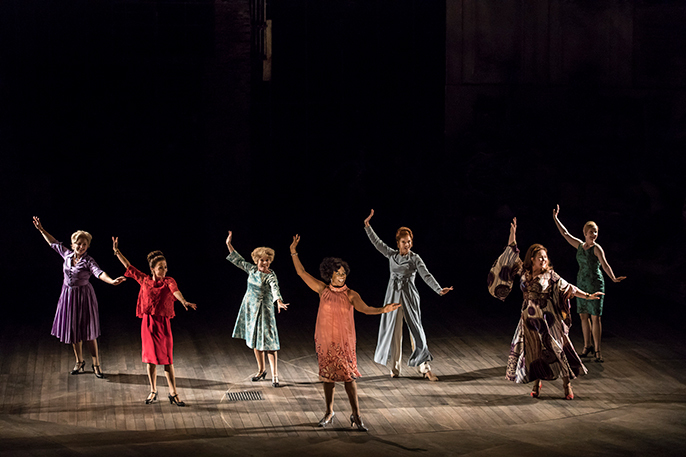 Almost 50 years since its first performance on Broadway, Follies has the power to engross, uplift, excite and inspire. A stellar ensemble, stirring score and vigorous choreography make Follies the quintessential high end musical. Complete with ballads, tap shoes and spotlights the piece embodies all the fantastical and dazzling elements of the genre. But unlike many musicals, Follies is intensely psychological with characters more multi-dimensional than a Rubix cube. There is a constant sense of pathos; a nostalgic yearning for times past. Cooke’s ardent direction has created a brooding and at times desperate tension which is manifest in the uniformly talented cast. An excellent expression of this turmoil is Carlotta Campion’s solo “I’m still Here’ by Tracie Bennett. What begins as a peppy show-tune with Campion reliving the trials along her path to success, ends as a bluesy lament, with Bennett overcome by triumphant exhaustion. Oozing with metaphor, the transformative set designed by Vicki Mortimer is a work of theatre-craft mastery. Managing to be both grand and imposing as well as ramshackle and crumbling, the revolving stage makes the transition between the two states seamless. A clever technique is having the orchestra visible through a semi-opaque backdrop, making the score another player in James Goldman’s story. With the music and lyrics by Stephen Sondheim, the piece was inspired by the Ziegfeld Follies of the 20s and 30s and pays homage to this fascinating aspect of theatre revues. Imperial beings garbed in peacock feathers and Grecian robes, strewn with pearls and presented to audiences to be worshipped. Follies also honours the boom time optimism of the 20s and post-Depression 30s. America was the Promised Land and Broadway was where small town girls became goddesses, immortalised in the annals of theatre legend. “Broadway Baby” sums up the thirst for stardom beautifully, with Di Botcher playing an exuberant Hattie. Each of the eleven once-a-grand showgirls is shadowed by her former on stage persona, except for Sally and Phyllis’ past selves, who wear the cotton housedresses and curls of the period. This places ‘young’ Sally and Phyllis outside of the untouchable fantasy world of Broadway and into the vibrant world of urban reality, where anything is possible, including heartbreak. 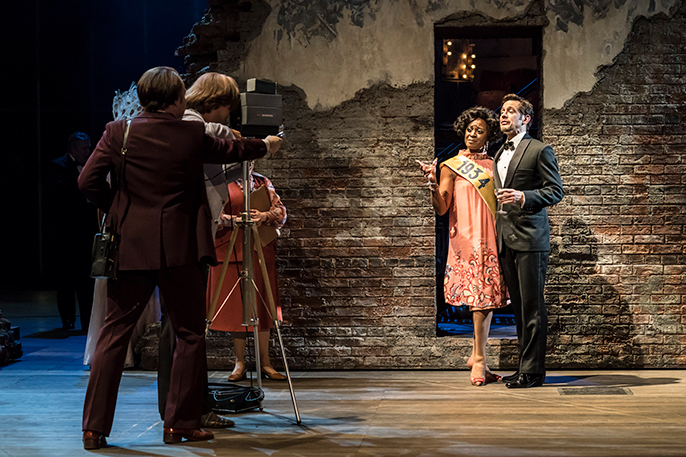 As Follies is a show of opposites, Imelda Staunton’s Sally is the complete inverse of Janie Dee’s Phyllis. Having traded love for $30,000 of silverware and society life, Dee is poised, arch and acid tongued as Phyllis, albeit impeccably dressed. Dee presents a kind of supercilious nobility, yet is at times playful with the role and shows considerable dancing skills. Staunton is skittish and impulsive as Sally, having all the insecure neurosis and agonising passion of her 19 year old self. Superbly played by Staunton, whose torch song “Losing my Mind” demonstrates her prowess as a soprano, the long, mournful notes bringing many a patron to tears. Try as I might, it is impossible to relate the full glory of this production. With such a large cast all giving their best performances and so many different levels to the piece, words simply cannot do it justice. This is a show that must be seen to be appreciated. 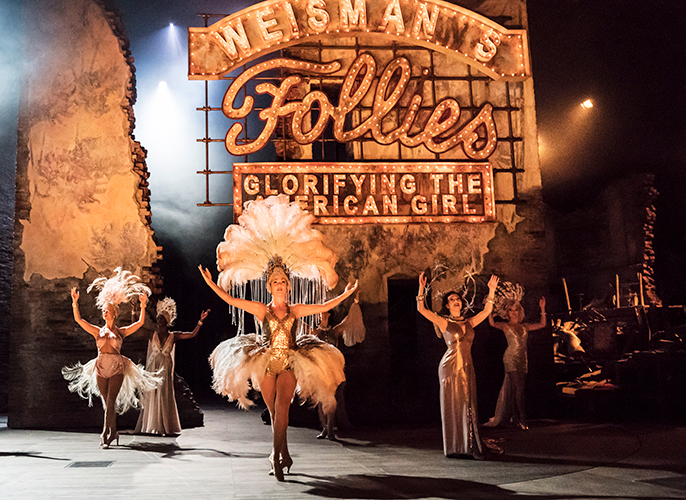 Almost 50 years since its first performance on Broadway, Follies has the power to engross, uplift, excite and inspire.